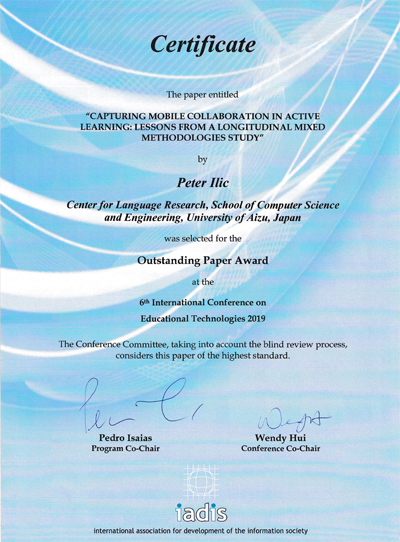 6th International Conference on Educational Technologies 2019(※1) was held at Lingnan University in Hong Kong from February 8 (Friday) to 10 (Sun) in 2019.『Capturing mobile collaboration in active learning: lessons from a longitudinal mixed methodologies study』of Associate Professor Peter Ilic(※3)of Center for Language Research(※2) received the Excellent Paper Award. This presentation reflects on an attempt to introduce smartphones into a blended learning context and highlights several methodological considerations relevant to the collection of mobile data. This paper describes the methodological issues that emerged during the planning and implementation of the study and adds to the knowledge of employing mixed methodology design for mobile data collection and analysis. In particular the advantages of incorporating Multidimensional Scaling (MDS) analysis with qualitative data.